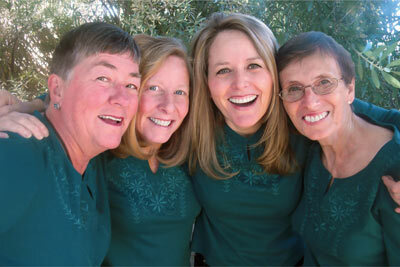 If you love to hear harmony, you won’t want to miss the all-female harmony-singing a-cappella quartet Harmony Rain. Harmony Rain has been singing and harmonizing together since 2009, performing popular songs from the 50’s and 60’s. They also sing several selections from the 1940’s and 70’s, and a folk song or two as well. Songs include Sincerely, Lollipop, Blue Bayou, Java Jive, and Dream a Little Dream of Me. Harmony Rain’s Holiday Collection includes classics such as White Christmas, Little Drummer Boy, Silver Bells, and Santa Baby, with a little humor of Desert Wonderland thrown in. Joyce, Michelle, Barbara and Linda have sung throughout their lives for the joy of singing, and are thrilled to sing together as a quartet. In addition to a cappella, they sometimes include background music, and you might also hear a barbershop chord from time to time. Harmony Rain performs in and around the Phoenix area and the east valley. They also perform as part of the 130-member Tempe Community Chorus, and sometimes with the Chorus’s small ensemble, Mill Street Singers. Click on a song, then click on the play arrow. Click the pause button to stop.